Tatjana Masurenko is one of the leading viola players of our time. Her distinctive style is shaped by her expressive playing and her thorough and intensive musical studies. Her charisma and natural stage presence are captivating. 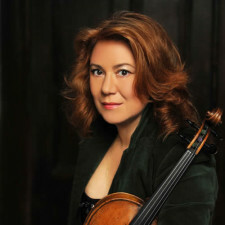 Alongside the great viola concertos by Walton, Bartók and Hindemith, Tatjana’s wide-ranging concert repertoire also includes modern classical works such as Schnittke, Gubaidulina and Kancheli and the rarely performed viola concertos by Hartmann and Bartel. Tatjana Masurenko has made solo appearances with orchestras including the Gewandhausorchester Leipzig, the Radio Symphonie Orchester Berlin, the NDR Radiophilharmonie and other leading orchestras in Europe and Asia. She has been a welcome guest at major international festivals as both soloist and chamber musician for many years. Born in Dushanbe (Tadzhikistan), she grew up in a family of Russian academics and jazz musicians. Her musical path began in St Petersburg where she was able to benefit from the traditional St Petersburg school with the best teachers of her time. It took two years to persuade one of her teachers (a viola player) that the little ten-year-old with small hands r e a l l y wanted to study viola. She continued her musical studies in Germany with Kim Kashkashian and Nobuko Imai. Her search for new forms of expression on the viola and new techniques and tonal concepts were encouraged and influenced by encounters with figures including Boris Pergamenschikow, György Kurtág, Brigitte Fassbaender and Herbert Blomstedt. For some years now, Tatjana Masurenko’s major objective in her musical career has been the further development of the viola as a solo instrument which also explains her commitment to contemporary music. She has given numerous first performances of new compositions, many of which are dedicated to her and originated on her initiative. She has worked with composers such as the recently deceased Gladys Krenek, Moritz von Gagern, Dimitri Terzakis, Wolfgang Rihm, Hans-Christian Bartel, Luca Lombardi and Nejat Başeğmezler. Tatjana Masurenko’s discography reflects the musician’s high artistic standards. Right from the start, she compiles the programmes of her CDs meticulously and with great deliberation. A number of her CD recordings (for example the concerto by K. A. Hartmann and British Viola Concertos featuring concertos by Walton, Beamish und Britten) received awards including the Preis der deutschen Schallplattenkritik and international accolades such as the Supersonic Award (Luxemburg) and the Diapason découverte (France). Currently, Tatjana Masurenko focuses intensively on historical performance practice in her CD recordings, not only within the context of Baroque music, but also the Romantic repertoire of the 19th century. Inspired by the concepts of Jesper Christensen, she has devoted herself together with the pianist Gilad Katznelson to interpretative aspects of this music, including the study of historical tone documents. Tatjana Masurenko employs great dedication and patience in the nurturing of young musical talent. In 2002, she was appointed professor for viola at the internationally renowned University of Music and Theatre “Felix Mendelssohn Bartholdy” Leipzig. She also gives masterclasses abroad in Spain, Canada, Scandinavia and other countries and is also the artistic director of the International Viola Camp in Iznik (Turkey) and the masterclasses in Leipzig und Düsseldorf. Tatjana Masurenko plays on a viola by P. Testore, Milan, 1756.